The Secondary Section enhances the professional lives of secondary English language arts educators and the quality of education of their students by providing multiple forums for significant dialogue on historical, current, and emerging topics of interest to secondary English language arts educators. The Secondary Section Steering Committee is pleased to announce the recipients of the 2017 High School Teacher of Excellence Award. Join us for the award presentation at the Secondary Luncheon on Saturday, November 18, during the NCTE Annual Convention in St. Louis, Missouri. 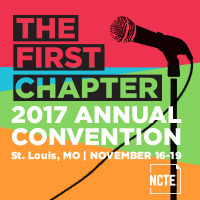 Join thousands of educators, experts, authors, administrators, publishers, and others in St. Louis, Missouri, for the 2017 NCTE Annual Convention! The NCTE Village is a community, not a location. At the center of this community is a celebration of your work through your stories. As we all know, it takes a village, and your stories speak volumes. Imagine what’s possible when we turn up the volume on tens of thousands of teachers speaking out about what we need to thrive in this profession. Tag your social posts about teaching and learning with #NCTEVillage to start building momentum around this concept. Share a story via our online form so we can share your words with the community. Not ready for a full story? If you share something shorter, it may end up on our Wise Words page. Engage with a lead ambassador to help carry the NCTE Village forward. NCTE's award-winning English Journal is full of ideas on the teaching of writing, reading, literature, and language for teachers in junior and senior high schools. EJ includes information on how teachers are putting the latest technologies to work in their classrooms. Learn how you can write for English Journal. Not yet a subscriber? Add English Journal to your NCTE membership today! NCTE members enjoy online access to ALL journals published more than two years ago. Go Green! Make a long-term impact on the environment by receiving English Journal-Green today! Every year NCTE leaders, members, and friends gather in Washington, DC, to raise awareness of the literacy issues that are central to our work. Learn more and join us! Check out the stories of advocacy told by NCTE members. The Policy Analysis Initiative is a network of NCTE volunteers who track state policy developments impacting English language arts, English studies, literacy, and the humanities. See what is happening in your state! This document was printed from http://www.ncte.org/second.